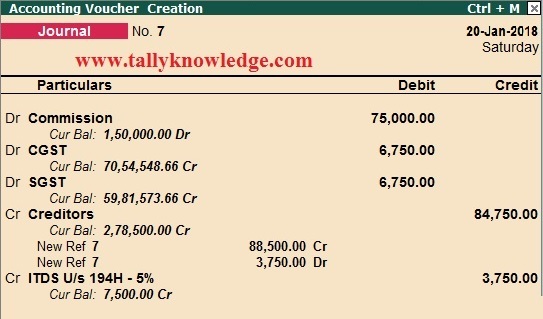 Home / GST-Tally / How to Create GST Input Credit TDS Entry in TallyERP.9? How to Create GST Input Credit TDS Entry in TallyERP.9? In this post we know about all kind of TDS entry in GST Regime. In GST Regime, there is no changes in TDS (Tax Deducted at Source) rates but applicability of TDS in GST regime having some conditions. So how can we enter TDS Entry in TallyERP.9. First of all, we need to setup all ledgers like creditors, expense, and duties ledger to calculate TDS on applicable rates for Example if payment to contract service tds will automatically deduct @ 1% (For individual) and 2% (For firm and companies). Go to Gateway of Tally - Accounting Info - Ledgers - Create. Create a creditors ledger. Enter all the required information in statutory details for Creditors. 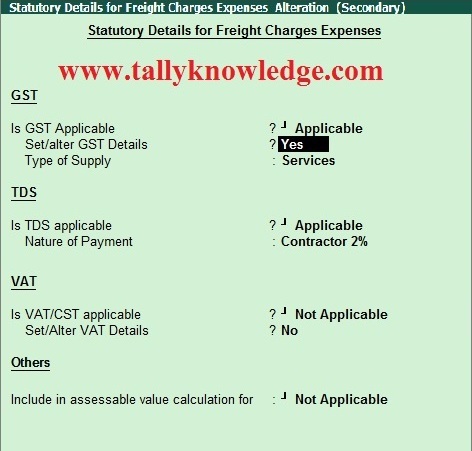 In above image, Select yes to Reverse Charge applicable because freight charges services always taxable for service receiver. Select no if reverse charge is not applicable. Now create a Tax Ledger of TDS (Tax Deducted at source), Select Duties and Taxes under Current liabilities, Select TDS under tye of Duty / Tax, now select TDS nature or TDS Rate (Do not forget to select linked tds category - suppose if TDS deductable is 2% then select TDS category@ 2%). 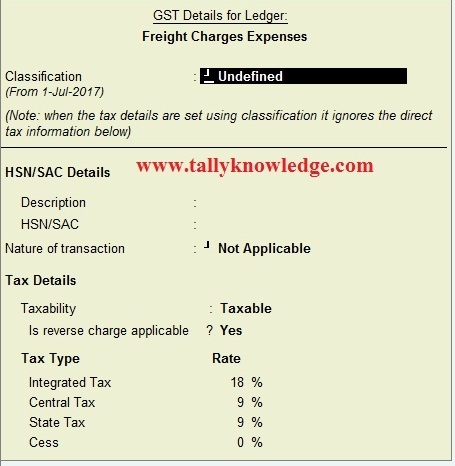 As we mentioned above - If you create Freight Charges ledger then create a journal ledger (For reverse charge GST Applicability). 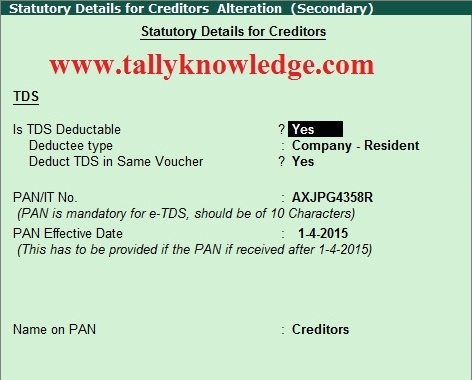 You can see n creditors section amount is automatically enter less after deduct TDS and Bill wise details comes with full amount and difference of this appear in Dr. side in bill wise details. Enter TDS Tax ledger. Press Enter or Ctrl + A to save the Entry. For Example Creditor A give us bill of Commission of Rs. 75000 including CGST and SGST @ 18% of Rs. 6750 each and TDS @ 5% on Rs. 75000 is Rs. 3750. For this transaction see below image. Through above image we also get input credit on Commission Invoice. Go to deduction Details and you can see both TDS entries will appear here. To check Reverse Charge and input credit go to GST Details. Here is details are appear. You can see there is reverse charge of Rs. 11250 of CGST and SGST is appear and also Reversal of the same is appear in the Computation.